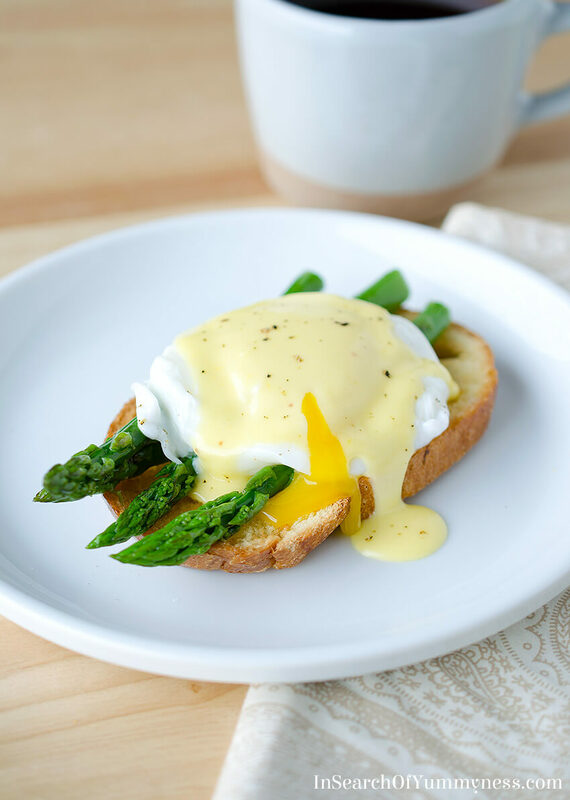 Tender-crisp asparagus puts a fresh twist on the classic Eggs Benedict recipe. Eggs Benedict has always been one of those dishes that I thought was too fussy to make at home. It was a special treat that I reserved for fancy brunches at restaurants, like the Windsor Arms Sunday brunch, and quite frankly it looked like too much work for breakfast at home. When you break the dish down though, it’s really not that complicated: two toasted English muffin halves, a slice of ham or Canadian bacon, a poached egg and a generous spoonful of Hollandaise sauce. 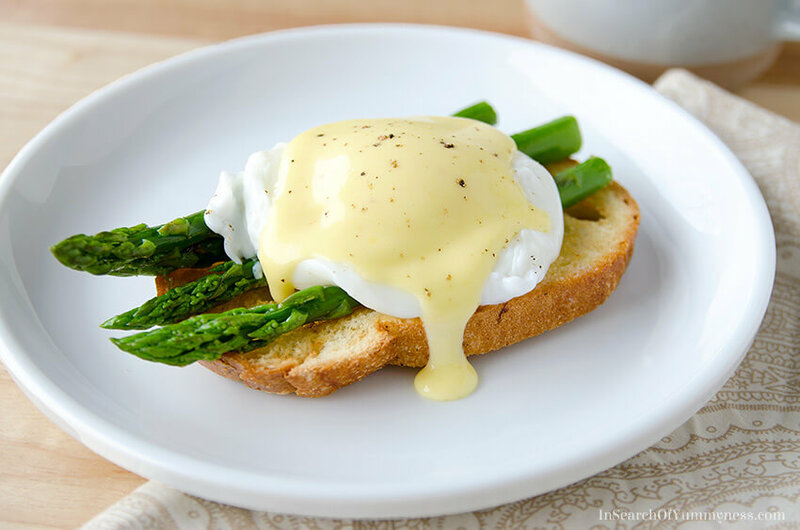 My eggs Benedict recipe is a bit unconventional – I’ve swapped in toast for the English muffin, omitted the meat and added in some fresh spring asparagus instead, but it’s just as tasty! My biggest stumbling blocks with this recipe were the poached eggs and the Hollandaise sauce, because I had never made either of those things before. I know, I know, I’m in my 30’s and I’ve never poached an egg? What?? Honestly, I’m not a big fan of poached eggs outside of eggs Benedict, so I’ve never felt the need to make them! I wish I had videotaped my attempts at poaching the egg, because I’m sure it would have been hilarious to watch. What a disaster! I followed Bon Appetit’s instruction on How to Make Stress-Free Poached Eggs, which should probably be renamed to How to Totally Overcomplicate Poached Eggs. I eventually realized that pouring the egg in from a height would cause the whites to explode upon contact with the water, which also separates the yolk. Spinning the water too quickly, and boiling the water (instead of simmering) has a similar effect. You can see some of my failures below. Eventually I found a Jamie Oliver video called Perfect Poached Eggs – 3 Ways, and figured out how to poach the eggs properly.He doesn’t strain his eggs, and he doesn’t continue stirring the water after tipping in the eggs, which worked out better for me. I’ve always learned better from seeing how something is done, rather than reading about it! I also learned that fresh eggs are key to making really nice poached eggs. My eggs were not fresh. Well, they were fresh to me, but I think they had been sitting in the grocery store for a while. Something to keep in mind for next time! I was happy with how my final eggs turned out, and I’m pretty sure that the process won’t be quite so painful the next time I try to make this dish. The Hollandaise sauce was actually not that difficult to make, but it is time consuming. If you’d rather use an instant powder, or a microwaveable recipe for the sauce, I won’t judge you. Sometimes you just want to eat and not go through all the fuss! My friend told me that you can get a decent jar of Hollandaise sauce from Loblaws grocery, and my ex-boyfriend made a pretty decent mock hollandaise out of mayonnaise, Dijon mustard, lemon juice and butter, so you’ve got lots of options! I used the Hollandaise sauce recipe from Martha Stewart’s Cooking School cookbook (oh, go ahead and laugh, the book is actually great!). My version of Hollandaise sauce has less butter than Martha’s version, so it’s not as rich. 3/4 cup of butter in the sauce just felt like too much for a breakfast dish. You can eyeball it though and see if the sauce is velvety enough for your taste or not. I also omitted the shallot reduction, because while that would probably be very tasty, I didn’t want to make this more complicated. 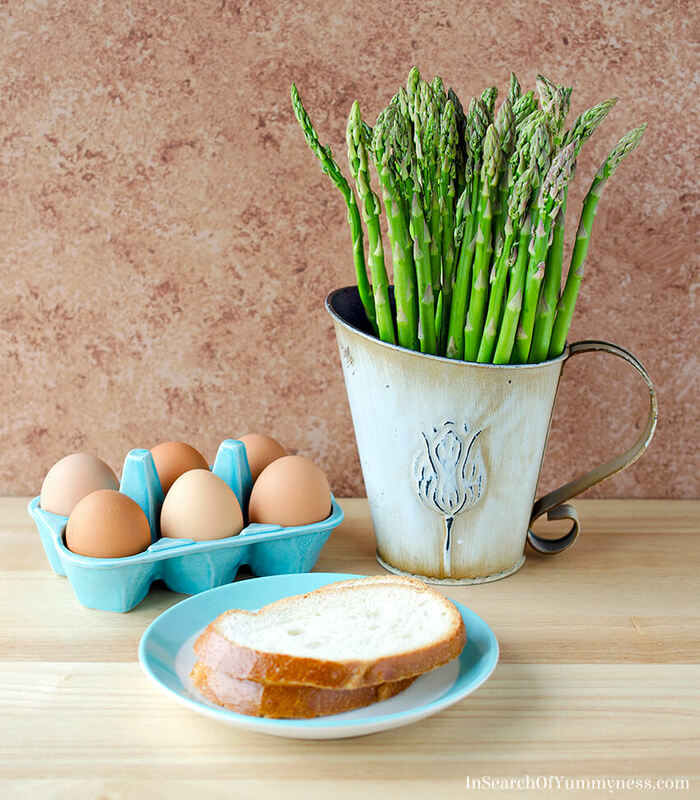 Fresh asparagus puts a springtime twist on this classic brunch dish. Add oil to a small skillet or non-stick pan and place over medium-high heat. Cook the asparagus for about 5-10 minutes, or until browned and tender-crisp. Season with salt and pepper, and remove from heat. Set aside for later. Fill a medium saucepan with a few inches of water and bring to a boil, then reduce heat to a simmer. Add egg yolks to a heatproof bowl and whisk until they become pale in colour. Place the bowl over the simmering water (make sure the bowl doesn’t touch the water). Whisk the yolks constantly and cook over the warm water until they have thickened, which takes about 3 minutes. Add 1 tablespoon of butter at a time, whisking constantly, making sure that each tablespoon is incorporated completely before adding the next. Once all the butter has been added, season with lemon juice, salt and cayenne pepper. The sauce should be thick enough to coat the back of a spoon, but not stiff. If it is too thick, thin it with a little water. The sauce is best if used immediately, however it can sit for about an hour in a Thermos, if needed. Leftover sauce can be reheated over low heat, with a little bit of water and melted butter whisked in. In large saucepan, heat water over medium heat until simmering. If desired, you can use a large slotted spoon to quickly stir the water, creating a spinning effect that can help wrap the whites around the yolks. Crack each egg, one at a time, into a small bowl, then gently slide each one into the simmering water. Make sure to tip the eggs in close to the surface of the water – not from a height. Cook the eggs until whites are set and yolks are still soft - about 3 minutes. Then remove the eggs with a slotted spoon and place on a plate. 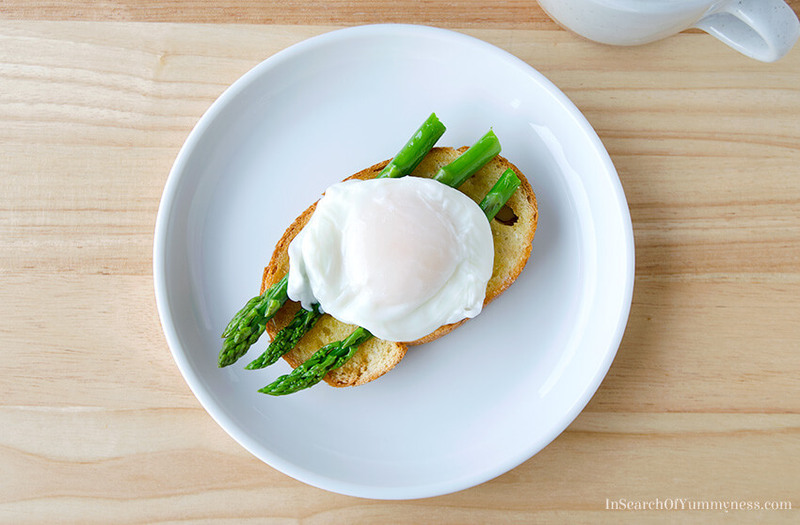 Butter the slices of toast, and arrange 3 asparagus spears on each piece. Carefully place one egg on each piece of toast, and top with a generous spoonful of the hollandaise sauce. Season with salt and pepper, and serve immediately. You can either pan-fry, steam, or blanch your asparagus for this recipe. That is so funny because we just made an eggs Benny recipe for a sponsored post and we made our own Hollandaise sauce as well (Jamie Oliver’s recipe ????). You did a great job with poaching the eggs, if it wasn’t for Loreto I wouldn’t know how to do. Never needed to poach an egg in my life in Italy where eggs benedicts are not in the picture ????. Love love the asparagus in place of the ham! Thanks! They were so much harder to poach than I thought they would be! Ah! This is perfect. 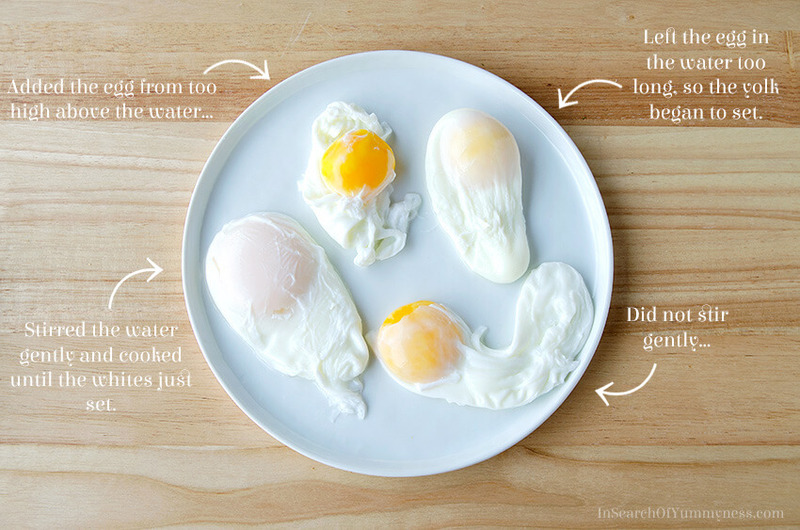 I remember my first time poaching eggs… after that I spent a rainy Saturday attempting different methods and seeing what went wrong. I love how you added the photos of your failures so you can compare the different elements that may or may not work for you. I also, personally, adore Martha and always have. She shares great foundational knowledge with a focus on technique. What ever is wrong with that? Thanks Amanda! I definitely need to keep practicing to get them right every time. I feel like Martha has become the Nickelback of the lifestyle world. No one wants to admit that they enjoy her work! Nice! I was thinking about making this yesterday! Hihi! Must be a sign ! I think it must be a popular dish for spring! Your pouched egg looks perfect ! Love how you put your “not so successful” ones together, makes a very nice and clear illustration ! Thanks for sharing ! Good looking dish! I can attest that hollandaise and poached eggs is not the first thing a breakfast cooks masters, but it’s important to learn none the less. You can find a detailed diy guide on hollandaise on my blog Earth, Food, and Fire. As for the poached eggs, I have never heard of stirring the water, I was always taught that as long as the water is just below simmering (something like 81C with small bubbles gently rising from the bottom of the pot) it should be hot enough to set the whites as soon as they hit the water. Again don’t splash them in, gently crack the egg in from just above the surface, or slide in from a small bowl. Most restaurants I’ve worked in will also add a splash of white vinegar to the water, which helps keep the egg white from breaking apart as they poach. Great job though! I really liked the picture of the different success (and failures)! Thanks for the tip Markus! The stirring tip is supposed to help eggs that aren’t quite fresh enough to wrap around and set nicely. Although, I have managed to mangle a few eggs that way because I was stirring too fast. I’ll have to check out your Hollandaise guide! Haha, thanks for stopping by Deb!